I had a hard time coming up with a name for this recipe, so I decided that a good description would be the best way to go. And this salad is seriously yummy. You might ask – what is Quinoa? Actually, that’s exactly what I asked about 6 months ago. Since that time, however, quinoa has become a staple in our diet and I love it. Quinoa is considered a whole grain, but it is actually a seed. It’s prepared like rice and can be used in a similar way. It’s super versatile – can be eaten alone with a little seasoning or can be added into recipes. With olive oil, avocado & feta cheese – this recipe has a rich taste and texture. But the sweet tomatoes add a nice contrast. I like to serve this with pan seared chicken or fish. We hope you’ll enjoy this recipe as much as our family does. Chop the fresh spinach – roughly chop the spinach so that you end up with medium sized pieces. 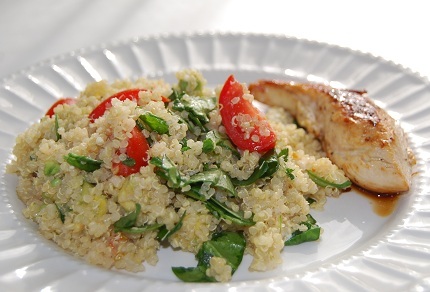 Add chopped fresh spinach & diced fresh tomatoes to the quinoa. Peel the avocado and remove the pit. Dice avocado & add to the quinoa mixture. Sprinkle Greek Seasoning over mixture. Squeeze the juice of one lemon into the mixture. Mix all ingredients well & serve! I got the idea for this recipe from a Better Homes & Gardens recipe – modifying it to our taste. Got quinoa in the pantry now. Heading to Costco to pick up groceries. Adding avocado to my list so I can fix this tonight.